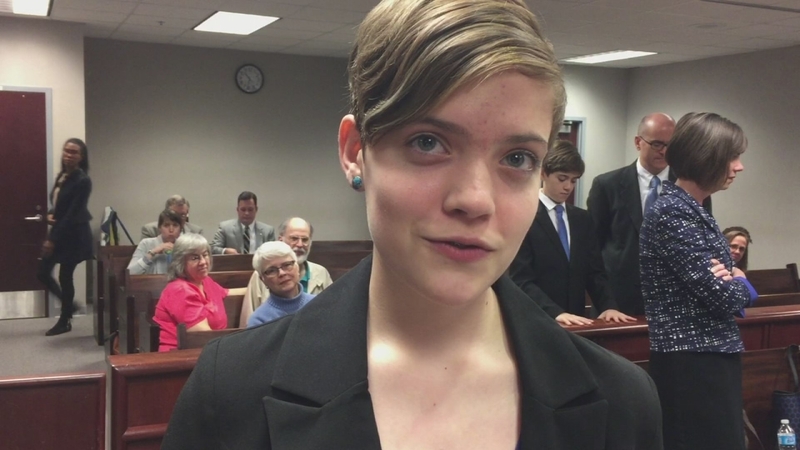 RALEIGH (WTVD) -- A Wake County judge says he'll rule in the next couple weeks on the case brought about by a 13-year-old who wants to see her environment improve. Hallie Turner has been a climate change activist since elementary school. "This is an issue that impacts everyone," said Turner, now an 8th grader at Ligon Middle School in Raleigh. "It's not only affecting me, it's affecting future generations. I feel like my voice needs to be heard so I can speak out for not only myself but generations to come." In August, President Barack Obama unveiled his plan to cut carbon dioxide emissions by 32 percent in the next 15 years. A plan that Governor Pat McCrory called an overreach that would threaten job creation while raising customers' power bills. Duke Energy, the nation's largest utility, has said it has already cut its power plant emissions by 22 percent since 2005. Turner has gotten major support for filing a lawsuit after her petition for new climate change rules was rejected by the N.C. Environmental Management Commission. A nonprofit helped Turner file the suit and attorneys at Duke University are among those representing her. "It's for me that I'm here in court today. It's not because of my parents or because of a mentor. Of course all these people have helped me along the way, but I've been motivated by the people around me and they haven't forced me to be doing this. "I know that our government has a responsibility to create a safe, healthy and sustainable environment, for all of its citizens and our leaders aren't living up to that responsibility," Turner said. Many agree with Turner but a lot of people don't. "The idea of North Carolina taking extra steps beyond what the federal government is going to call for to cut carbon emissions, the idea that that would have any impact on global warming, is ludicrous. It would not happen. All you would do is put another obstacle or road block in place in terms of industry in North Carolina for no good reason," said Mitch Kokai, a spokesperson for the conservative John Locke Foundation. Kokai is far from alone holding that opinion. Despite reams of science on the issue, there's still considerable debate over how real climate change is and how much it's tied to human behavior. And both sides tend to see their side as right on the facts. "I think it's beyond dispute that if North Carolina took steps on its own to address global warming there would be no impact. So suing the state to take these steps is not going to have the result that this obviously committed student wants to have," said Kokai. "You believe in the facts or you don't believe in the facts. It's not something you believe in. You either choose to see the facts or you choose to ignore them," said Turner. Wake County judge Michael Morgan said he'd rule on the case before Thanksgiving.